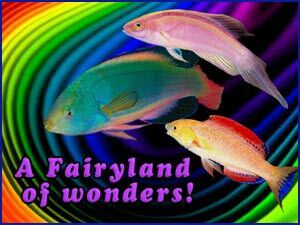 Animal-World proudly features: Fairy Wrasses, an aquarium fairyland at its best! These gorgeous fish came into my life shortly after I started into the saltwater hobby. Fairy Wrasses quickly became my personal favorite finned fish when they first began to appear many years ago. They have held a special place in my heart ever since! Initially Fairy Wrasses were not too expensive but then prices started to soar for a few years. Now they are at a moderate to very high price, depending on the species you want. Still they never disappoint and each species seems to have a little bit of a unique personality. Sometimes it’s a decision between paying the electric bill and buying a wrasse. Yes, it is an illness! The Cirrhilabrus (which is their genus name) are very easy to care for. They are also easily trained to eat out of your hand, given time and patience. Then every time you walk by the tank they scream “look how pretty I am, feed me!” So hey, throw in a little smidgen of food if you want because their super energy bodies appreciate it. The only down side to keeping a Fairy Wrasse is that they love to carpet surf. Being avid jumpers they can quickly leap out of the tank. This is easy to prevent however, if you are careful about their tank mates and provide a lid of some kind. An awesome trait is that they are fairly disease resistant, and sleeping in a slimy cocoon at night helps them in this capacity too. Fairy Wrasses, A spectacle to behold! A great thing about the Cirrhilabrus species is that there will always be a color and size that will fit in your tank. If you have a 20 inch long aquarium, choose from the smaller 2.6″ to 3″ species, but if you have a larger tank, you can choose from the wrasses that are over 3″. One of the smaller species is the 2.6″ Yellowfin Fairy Wrasse Cirrhilabrus flavidorsalis and a large wrasse would be the 5.1″ Scott’s Fairy Wrasse C. scottorum. Some the most outstandingly colored wrasses, and a few favorites, are the Laboute’s Wrasse Cirrhilabrus laboutei which has amazing striping and the Flame Wrasse C. jordani with intense sunset colorings of red, orange and yellow. The Purple-Lined or Lavender Fairy Wrasse C. lineatus is beautifully adorned with yellow and red fins on a greenish yellow body with blue to purple lines. Another favorite is the Temminck’s Wrasse C. Temminckii, who seems to have the qualities of a flasher wrasse. Its body has many colors of the rainbow with bluish green dotted lines along the top, reflecting the reef line in your tank. It’s not hard to see why these are some of the most sought after fairy wrasses, and their price tags reflect that fact! Fairy Wrasses range in price from $15.00 to $250.00 each. The color, but also the depths at which they are found, add to the price. Those that are found at very deep levels of the ocean are the ones that are the most expensive. They are also the ones who are very susceptible to improper collection, and because of this have the highest mortality rate, usually within a month of purchase. Who wants to come home to a $250.00 fish that is now dead because of carelessness? I sure wouldn’t! So keep that scenario in the back of your mind and demand a guarantee on these pricey fish. Wrasses come in so many colors and patterns that even a tighter budget can allow for similarly colored, yet cheaper version of each. For example, if you want a fish with green or blue, the Indonesian Scott’s Fairy Wrasse C. scottorum will run you up to and over $100.00 USD. Yet the Solar or Red Headed Fairy Wrasse C. solorensis, which is my personal favorite, is similarly colored and will only cost around $40.00 to $50.00 USD. If you want a little red or orange, you can choose the Jordani Wrasse at $250.00 for a super male, or a $35.00 Redfinned Fairy Wrasse C. rubripinnis. How about pink? The Laboutes’ Fairy Wrasse has some pink, but is again very expensive. On the other hand, the Lubbocki’s Fairy Wrasse has similar coloring but is one of the least expensive. The Laboute’s patterning is by far more amazing though. If you are limited on space but you are chomping at the bit to own a fairy wrasse, no problem. The smaller species will do well in a 30-gallon, or even a 20 inch long. They are movers and shakers though, so will do better with length over depth in a tank configuration. The larger species need at least 55 gallons, which should be at least 4′ long. Be sure to have a lid on the aquarium. These wrasses do jump, and they will carpet surf at some point if the tank isn’t covered. An Atlantic Tang juvenile actually sparred with my Solar Fairy Wrasse, and chased him up and out of the tank! The substrate is also no problem; you can choose whatever substrate you want. In fact you don’t need substrate since the Cirrhilabrus species do not bury themselves at night. They spin a slimy cocoon to sleep in. Provide lots of rockwork with crevices or caves for them to spin their cocoon in at night. The cocoon prevents their scent from being detected by predators, but will not affect water quality. Speaking of water quality, Fairy wrasses are quite disease resistant, but dirty tanks can still result in a sick wrasse, so be sure to do proper maintenance. Fairy Wrasses are very active, and with that high-energy output there needs to be quality input. Provide them with a wide variety of meaty foods and feed them several times a day. The more you feed them, the less they will be inclined to chow on any copepods you have built up over the months. In smaller tanks you may need to add copepods periodically. These wrasses don’t usually fill up too much on copepods when there’s lots of rockwork unless you have a large number of wrasses. I had about 5 fairy wrasses and a mandarin in a 150-gallon tank that was teaming with copepods, and the copepod numbers never seemed to dwindle. Other species, like Halichoeres Wrasses, are much harder on copepod populations. Here are some considerations for keeping different Fairy Wrasse species together: Fairy Wrasses are some of the few saltwater fish where you can easily mix species. A great thing about keeping Cirrhilabrus wrasses together, is that there is no fight to the death, just chasing. Then after a hierarchy is established, life goes on. At the very worst a dominant wrasse will chase, and then the subordinate fish will hide. I had a Solar Fairy Wrasse that hid for a week under a rock when I added the Scott’s Fairy Wrasse. The Solar Fairy eventually got used to the idea and came out. You will only need to remove a subordinate fish if the chasing situation has not resolved itself in over 2 weeks. You can keep multiple Cirrhilabrus species if you follow a few guidelines. First, the tank should be larger than the minimum size. When mixing sizes, the 2.6″ fairy wrasses like the Lubbock’s C. lubbocki and Longfin or Social Fairy Wrasse C. rubriventralis, should be added first and become established before adding wrasses in the 4″ size category. The Solar or Red Headed Fairy Wrasse C. solorensis is an exception, it can be added at the same time. What I really like about the Solar Fairy Wrasse is that although it is one of the bigger ones, they seem to do okay with the smaller species because they have more mellow personalities. They will get along with the larger wrasses too. Allow several months for the smaller wrasses to grow a little and adjust. Add the largest 5″ fairy wrasse species last, and add them as small juveniles so they are similar in size to your smaller and more timid wrasses. These larger ones would be like the Scott’s Fairy Wrasse C. scottorum, Temminck’s Fairy Wrasse C. temminckii, and Yellowstreak Fairy Wrasse C. Luteovittatus. I suggest that order for these larger wrasses because experience showed me the C. Luteovittatus can be quite aggressive, and that was in a 150-gallon tank! If you are unsure about compatibility between species, or do not want to try and remove fish after adding them, your safest bet is to not house smaller wrasses, that are only 2 1/2″ to about 3”, with the larger 5″ wrasses that are more aggressive. You can house 4 – 5″ wrasses together without a problem provided you add the 5″ size last, and after the 4″ sized wrasses are settled and older. Adding two females has resulted in one turning male for many an aquarist, though they may not become a “super male”. Super males are a premium fish with the most outstanding coloration, as reflected by the money you pay for them. Keeping Fairy Wrasses with other fish: Cirrhilabrus species get along with most other fish, except the very aggressive fish that may bite at them if they enter their territory like dottybacks. Do not house them with fish large enough to swallow them whole. Do not house with flasher wrasses Paracheilinus spp., since for some reason, the Fairy Wrasses do not tolerate them. It may be they are competing for similar foods. Very small fairy wrasses may be okay with flasher wrasses, but that is only in a very large tank over 100 gallons or at least 5′ long. Smaller Halichoeres species will be attacked by fairy wrasses as well. Keeping species of these two genus together may work as juveniles, but only if the Halichoeres is larger. Halichoeres Wrasses differ in their sleeping behaviors too, they do bury themselves in sand while the Cirrhilabrus species do not. You just can’t go wrong with a Fairy Wrasse. They rarely are the troublemakers of the tank, and if they are, it’s with their own kind. So save those pennies and buy your future favorite fish! Carrie McBirney is a team member at Animal-World and has contributed many articles and write-ups.